The Ontario Tories bared more than their...uhh...private members...this weekend, releasing their election platform (summarized by CP here). That, roughly, is Tim Hudak’s estimate of what Ontarians want in this year’s provincial election. So on Sunday, the Progressive Conservative Leader unveiled a platform – “changebook” – that gives voters the option of keeping most of Dalton McGuinty’s priorities, without keeping Dalton McGuinty. Sure, Hudak dangles a few carrots, but the HST, corporate tax cuts, and all-day kindergarten are here to stay, and Hudak promises only a few administrative tweaks to the Health Care system. This follows up recent flip-flips on the Human Rights Tribunal and health premiums. Sure, he's still promising to scale back the Green Energy Act, but it's unclear where he'll find the kilowatts to accomplish this and still follow through on McGuinty's promise to close Ontario's coal plants by 2014. There are, of course, a few populist trinkets recycled from the federal election - income splitting for couples and removing the HST from home heating fuels. While these will be popular, they do open up Hudak to the "hidden agenda" attack. After all, Hudak will not be able to pay for his $3-11 billion in goodies (depending on how you count it) solely by having 6 fewer Cabinet Ministers. So expect the Liberals to counter with some nasty hidden agenda commercials once we get closer to Election Day. For now, the OLP has launched a feel-good spot - it's a minute long, very similar in style to the positive beer commercials run by Harper last election. 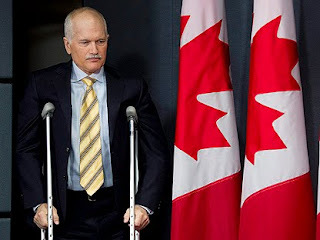 NDP Leader Jack Layton is once again stating that a straight majority would be enough for Quebec to legally secede from Canada in the event of a third referendum on sovereignty. Despite Layton's statement, the NDP is still somewhat bashful about its repudiation of the Clarity Act. Just watch this interview where Evan Solomon asks MP Peggy Nash about her party's position on the Clarity Act four times, only to have her dodge the question four times. I just don't see how the NDP will be able to straddle the divide on issues of federalism for four years - the last time someone tried this, it exploded in Brian Mulroney's face, destroying his party and very nearly the country. The fact of the matter is there are NDP MPs who are unclear how they'd vote in a referendum. The party opposes the Clarity Act. They want to expand Bill 101 to the federal workplace. Layton favours a round of constitutional negotiations to create "winning conditions". In addition to the above, it seems certain other issues will emerge over the next four years - especially with the PQ poised to take power. The NDP has taken great joy in dividing the Liberal Party at every opportunity during the minority years. Now, the Liberals have a golden opportunity to return the favour if they can bring what's left of their Quebec caucus onside. It won't be hard to toss federalism grenades into the NDP tent - a few mischievious opposition day motions should do the trick. By returning to its strong federalist roots, the Liberal Party could in one fell swoop put the squeeze on the Dippers, score points outside Quebec, and become relevant in the West. And if you assume that more than 14% of Quebecers are strong federalists, there'd be little electoral backlash in La Belle Province. It's abundantly clear the NDP's Beau Risque is going to give them headaches. The Liberals should position themselves so that they're the ones who benefit. As I've said all along, this was the obvious choice for interim leader. Rae is a gifted politician, and will keep the party relevent while it rebuilds. Bob Rae says the Liberal Party should look to a new “generation of leadership” – but in the interim, he is happy to serve as leader. The 62-year-old Toronto Centre MP and former NDP premier of Ontario was named interim leader by the Liberal caucus on Wednesday morning. “The people of Canada gave the Liberal Party a very clear and tough message in the last election,” Mr. Rae said at a lunchtime news conference. “It's a message that we have received and understood. 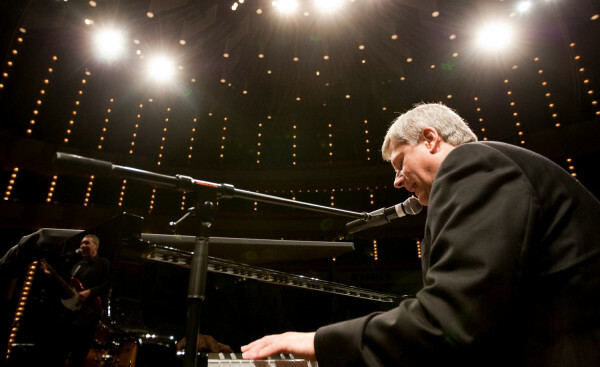 More importantly, the stage has now been set for the 3-way dueling pianos debate the country desperately needs! I've held off commenting on Liberal leadership timing because it's been so hard to figure out what's going on. If it wasn't for Jane Taber, I'd really have no idea what was being discussed or debated. For those just tuning in now, the Liberal constitution calls for a new leader to be crowned no longer than 5 months after the old leader resigns. That would mean an October vote, which most feel would be rushing things, given the next election is four years out. Luckily, the Liberal constitution is not so much chiseled in stone as drawn on an Etch E Sketch, so the party has called an "extraordinary" convention for June 18th to change the constitution and extend this timeline. You can read the exact wording of the motions up for debate on the 18th here - the short of it is the National Executive must call the leadership race 5 months before it happens, with the vote held between November 2012 and February 2013. Here's where it gets confusing. I'm talking Lost season 5 confusing. If the leader is picked in November or December, anyone who signs up to be a Liberal member after September 1st of this year is eligible to vote. However, if the National Executive opts for a January or February vote, the membership race won't really be on until September 2012. Well, at least in terms of membership sales. It's awfully naive to assume the race hasn't already started and won't be top of mind for the next 18 to 22 months. After all, with no more election speculation, the media will need something to fill their columns with, and there are only so many Ruth Ellen Brosseau stories one can write. On a slow news day, I'm sure it won't be very hard for the press gallery to find an anonymous Liberal willing to speculate about who will enter the race or who's "winning". If you thought the 2006 Liberal leadership race dragged on, be prepared for a contest over twice as long. That's not to say there aren't benefits in a longer process. An October vote certainly feels rushed, especially with a slew of provincial elections coming down the pipe. An 18 month marathon would give party members time to properly scrutinize the candidates. And collect swag. Lots and lots of swag. But there are many problems with the longer race. The first is that Liberals will be thinking about leadership rather than renewal when they elect party officials in January. After all, only the National Executive has the power to call the leadership convention and, as discussed above, there's a huge difference between a late 2012 and early 2013 vote in terms of the membership cut-off. I also feel like it would be easier to get down to the business of party renewal after a leadership contest. Let's be honest - leadership is a distraction. Ideas will be judged on which candidates support them rather than their own merits. Many of the proposed changes will no doubt involve the leader, so it might be a good idea to have a leader before implementing them. And some of these changes will take time - if a new leader takes over in February 2013, by the time they have their office up and running, the party will have already shifted into election readiness mode. Personally, I'd like to see a leadership vote sometime between April and June next year. To me, neither a 5 month nor an 18-22 month leadership contest are appealing options. That said, we're in uncharted waters here, so I could still be persuaded on the merits of either option with a compelling argument. Most frustrating is that for all the talk of a "consensus forming" around this timeline, there was never a widespread effort to ask members what they thought. It's beyond me how a party able to organize a 3,000 person teleconference convention isn't capable of taking an online straw poll of its members to see what they think. At least then I'd feel more confident this is truly the timeline the membership wants. Baring an amendment to the motion, we're either in for a chaotic leadership scramble or a slow 2-year leadership march that risks overshadowing the renewal process. There has been a lot of talk about Liberal Party renewal since election night. Which is encouraging - after a punch to gut like that, it's easy to give up, but it sounds like there's a real appetite out there to change the party for the better. Bellow is a sample of posts and article - by all means if you've seen any others, e-mail me and I'll update the list. I don't necessarily agree with all the ideas being floated, but at this point everything should be debated. Also, thanks also to those who have e-mailed in their thoughts on what the Liberal Party needs to do. I'm keeping track of everything, and intend to explore some of the ideas being floated in a series of blog posts this summer. PARLIAMENT HILL—Prime Minister Stephen Harper’s inflammatory decision to stuff two failed Conservative election candidates back into the Senate on Wednesday does “boggle the mind,” Conservative Tim Powers admits, but argues the storm of controversy will focus public attention on the unelected Upper Chamber, stir up a “hornet’s nest,” and spur support for Mr. Harper’s plan to reform the Senate. Mr. Powers admitted to The Hill Times the impending appointments are an absurdity—which continued to draw rising criticism on Thursday with two provincial premiers attacking them and backroom Tories in the Senate even raising eyebrows. But Mr. Powers blamed the minority Liberals in past Parliaments for the spectacle, saying they delayed Senate reform measures that Mr. Harper has been proposing since 2006. Mr. Harper also announced his intention to send another defeated Conservative election candidate, former intergovernmental affairs minister Josée Verner, to the Senate, but the ire of critics was focused on the two former Senators. It's no surprise the Liberals are to blame, but that kind of obvious spin won't win you awards. Where Powers really brings it home is when he postures about Harper's strategy to do "mind bogglingly" awful things as part of a master plan to stir up the hornet's nest and spur on support for senate reform. Maybe this has been Harper's strategy all along. He shuts down Parliament so that Canadians learn a valuable lesson about democracy. He destroys the Census so that Canadians learn to appreciate it. He takes the country from surplus to deficit, to spur on public support for fiscal responsibility. This post is just a collection of blog postings on the past election, for the sidebar archives. Consider it a place to visit at any point over the next four years when you're feeling nostalgic for daily polls, ads, and news stories. When Jack Layton promised that "I will create more jobs" during the campaign, many scoffed at him. Turns out he was right. In addition to their rookie MPs learning the ropes, one significant challenge facing the NDP will be the number of rookie staffers who run their offices. After all, many of the types of people who usually fill those positions are now the ones hiring. 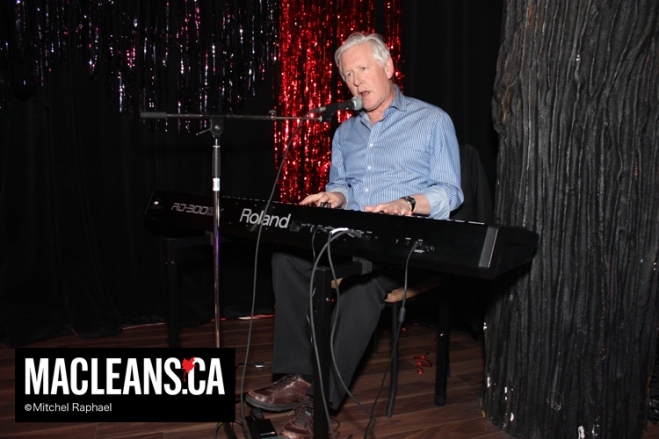 Bob Rae has decided he won't take a third shot at becoming permanent leader of the federal Liberal party. Instead, sources have told The Canadian Press the Toronto MP is about to announce his interest in becoming interim leader until a permanent successor to Michael Ignatieff is chosen some 18 months from now. And the funny thing is, if Rae gets 18 months as interim leader, that will leave him in charge of the Grits for nearly as long as Dion (2 years) or Ignatieff (under 2 and a half years). Prime Minister Stephen Harper has appointed three losing Conservative candidates to the Senate — including two former senators who had stepped down to run in the recent federal election. Larry Smith and Fabian Manning resigned their Senate seats to run for election, but both lost. Josée Verner, who was Canadian Heritage and intergovernmental minister under Harper but lost her riding on May 2, is also getting a Senate seat. I'm sure we'll hear the usual excuses, but this is really the last time Harper will get a free pass on Senate appointments. The "Liberals did it" line begins to wear thin in your third mandate, and Harper is now up against an official opposition proposing to abolish the Senate, with bit more credibility on the file. 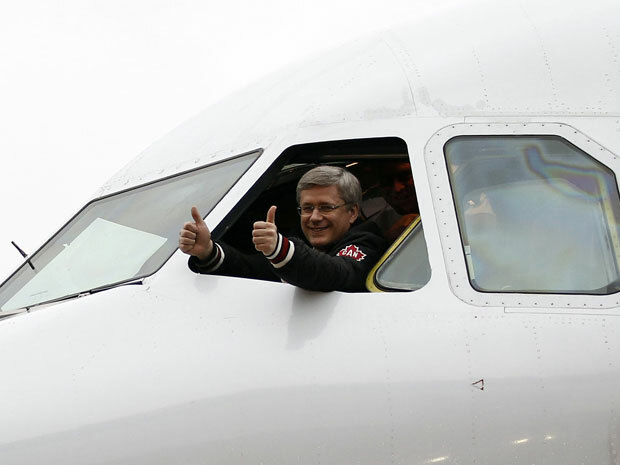 More importantly, Harper now has his majority in the House...and in the Senate. Yes, his hands are tied by the constitution to a certain extent, but Harper is in a position to make changes. There's no excuse left for this continued trip to the patronage trough. He either needs to start proposing tangible Senate reforms, or admit it's something he just doesn't care about. No, Maxime Bernier didn't bring a date to the swearing in. There's a Seinfeld episode where George is trying to get fired by the Yankees but, no matter what he does, Steinbrenner refuses to axe him. Suffice to say, someone trying to get fired from a Stephen Harper Cabinet would likely have very much the same experience. Which explains why Bev Oda is back. And it explains why certain Cabinet Ministers continue to lumber along without really doing anything (fun fact: despite all evidence to the contrary, Rona Ambrose is actually still an MP). 1. Younger Ministers who might have been in line for a promotion, like Jason Kenney or James Moore, stay where they are. Some will interpret this as Harper trying to keep down would-be-successors, but I tend to see it more as Harper actually wanting to keep ministers in portfolios they're handling well. In the case of Kenney, it seems obvious he's far more valuable to the Conservatives in Immigration than anywhere else, so I never really put much stock in the rumours he'd be moved. 2. Tony Clement goes to Treasury Board to make the "tough cuts". Yes, that's the same Tony Clement who took the art of pork barrelling to new heights during the G20 and found a way to make the Census more expensive. 3. John Baird goes to Foreign Affairs, presumably to add stability to a portfolio that has seen 5 Ministers over the last 5 years. Despite this, we can still expect Baird to answer questions in the House of Commons on behalf of the 37 Ministers Harper does not have confidence in. 4. In total 39 MPs wound up in Cabinet, tying Mulroney for the record of the largest Cabinet ever. Among the new positions created is "Associate Minister of Defence", confirming that Harper wants Julian Fantino in Cabinet, but doesn't want him doing anything more important than being Peter MacKay's wingman. 5. Among the rookies are Tim Uppal, Alice Wong, and Bal Gosal. More diversity in Cabinet is a good thing, even if the motives behind it may be political. 6. Maxime Bernier is back in Cabinet, albeit only as a Minister of State. Sadly, we'll never know if Harper put Max back in because all was forgiven, or because he had no other options in Quebec. It will be interesting to see whether Bernier remains the Minister Of Keeping It Real, or if he starts toting the party line. 7. Joe Oliver seems to be the only new Toronto MP who grabbed a spot. Which is somewhat surprising given the buzz around Chris Alexander, Mark Adler, Kellie Leitch, Eve Adams, and others. Mind you, if you're not going to fire anyone (besides Rob Merrifield and Rob Moore) and you want to ensure a "trim" 39 member Cabinet, you need to draw the line somewhere. Shortly after the 2008 election, Stephen Harper caught everyone off guard with his plan to kill the per-vote subsidy political parties get. The backlash was intense, and this was seen as part of Stephen Harper's Machiavellian plan to kill the Liberals. After this election, no one will be surprised when Harper decides to kill the subsidy. And, as a Liberal, I'm not nearly as worried about this move as I was two years ago. Looking at these figures, it's fairly obvious why the Conservatives are planning to kill the subsidy. This is obviously a partisan cheap shot, but voters have given Harper his majority, so partisan cheap shots are to be expected, and there's little that can be done to oppose them. Killing the subsidy, would drop Conservative Party revenue by 37%, Liberal revenue by 43%, Green revenue by 43%, NDP revenue by 64%, and Bloc revenue by 73%. Like I said, the actual impact will depend on how well the different parties adapt. The Bloc can tap into the PQ fundraising apparatus, and the NDP will find they have many new friends they didn't have before. However, if the Liberal Party can keep its membership engaged and effectively fundraise, the end of the subsidy might actually help them in their quest to wrestle back second place from the NDP. 1. The Liberals are still searching for an interim leader. Perhaps we should just name an interim interim leader, while the search goes on. Liberals appear convinced Bob Rae would make a fantastic interim leader...they just don't want him anywhere near the permanent job. After all, the Liberal Party must look to the future, which explains why the sons of Pierre Trudeau and Romeo LeBlanc are the front runners to replace Ignatieff. 2. On that topic, the leadership vote has been called for October. Only it hasn't. There will be an "extraordinary" telephone convention to change the rules in June, which would mean a leadership vote in...I dunno...I guess sometime before the 2015 election. But that's just a guess at this point. 3. Cabinet shuffle speculation is still at a feverish pitch. As usual, everyone's speculation will be wrong. 4. Ruth Ellen Brousseau is still in the news. 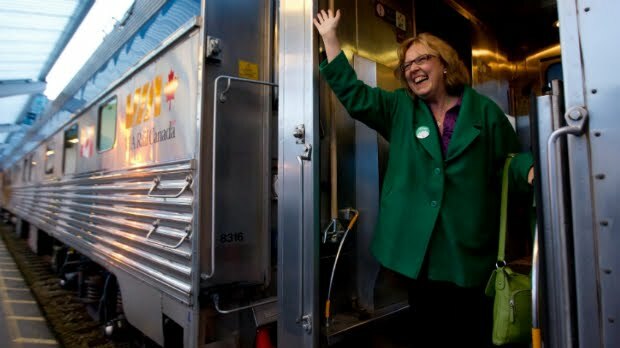 While she may not be known by the voters who elected her, but she is probably one of the most recognizable MPs in Canada right now. The Globe seems to run her picture on every story - even those talking about Liberal leadership, Barack Obama, and Arnold Schwarzenegger. Every REB sighting or non-sighting has become front page news. Which is a nice break for the other 20 equally unqualified MPs in Jack's caucus. 5. Two weeks after Canadians voted, and Jack Layton is still winning seats. This man is simply unstopable. 6. What has changed in the past week is the projected date we'll get out of deficit. That campaign promise didn't last very long, now did it? I don't have much to add to the post-election discussion on the NDP's past, present, and future, as most of the key points have already been beaten to death. 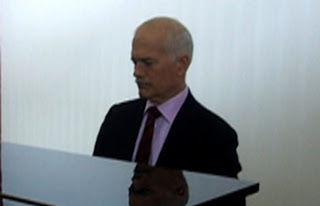 But it's worth a moment to pause and appreciate what Jack Layton accomplished last Monday. Layton inherited a party with 13 seats in the House of Commons, and took them to 19 seats...then to 27...then to 37. That, by itself, would have been impressive. Then, this election, he took a 50 year old party and not only led them to their best showing ever, he more than doubled their previous record of 43 seats. Ten or twenty years from now, the words "Jack Layton" will appear under the NDP leader's name on any Debate Bingo sheets or drinking game. Quite simply, Layton will now be a god to future New Democrats, the way Tommy Douglas currently is, and the way Ed Broadbent almost is. What he has accomplished cannot be understated in the least. I start with this little ode to Jack, because the NDP's success is owed entirely to him. I know that can be said of most parties in Canada, but this was a vote for Jack and Jack alone. And deservedly so, since his performance was masterful from start to finish. I think back to the very first day of the campaign, when all three leaders faced difficult questions. The way they dealt with them foreshadowed what was to come. 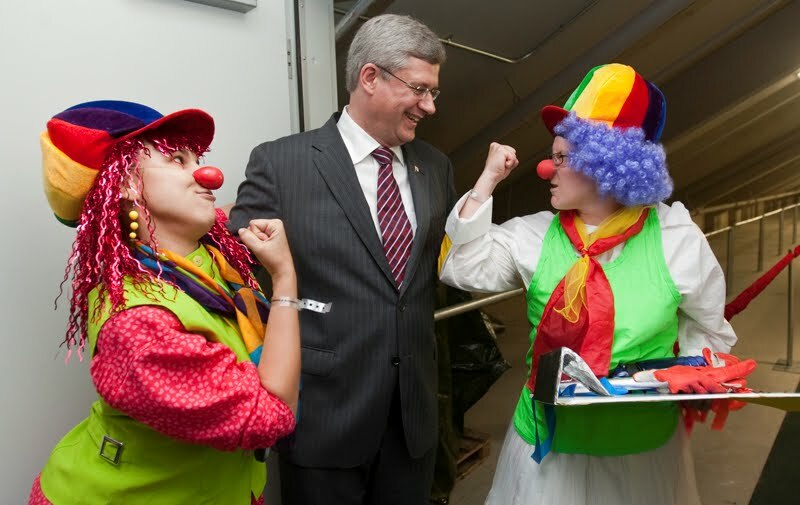 Harper simply refused to take questions. Ignatieff gave an incoherent answer to the coalition question, forcing him to clarify his position the next day. Layton faced difficult questions about his health with a smile and a joke - everyone seemed satisfied and that was the end of it. And that was how Layton approached the entire campaign. NDP ads were as vicious and unfair as Liberal or Conservative ads, but they featured cartoons, and ended with Jack smiling and saying something that made you feel good about him. Every second word out of his mouth was an attack on Harper or Ignatieff, but he had a cheerful way of delivering his lines that made voters feel like he was running a positive campaign. In fairness, the other half of the words were positive, with promises to help seniors, hire doctors, and cut taxes. The math didn't add up, but math doesn't win elections. The story was much the same during the debates. That was really when this campaign turned. His attacks were pointed and, unlike Ignatieff, they were on issues voters could relate to. Ignatieff's attendance record may not have been the most important issue facing the country, but Layton put it in terms people could understand, leaving the Liberal leader stunned and speechless. In short, Layton gave voters everything they wanted in those debates - he looked like a fighter, he looked cool, he looked confident, and, most importantly, he showed how he'd make their lives a little easier. Voters started trickling his way soon afterwards and, once the people realized it was okay to vote NDP, the trickle turned into a torrent. Layton's biggest challenge in the coming years is to leverage his personal popularity to strengthen the NDP brand. After all, this was a vote for Jack, not a vote for the NDP - to form government and ensure the next NDP leader has a chance at forming government, Jack needs to get Canadians comfortable with the idea of voting for the NDP. Doubts about the NDP's ability to govern will only be heightened as his rookie caucus continues to make headlines for all the wrong reasons. After all, the media won't be able to write election speculation stories any more, so the easiest way to get content for a column will be to stick a microphone in the face of one of the NDP rookies. Suffice to say, a crash course in media relations and the art of the "no comment" will be coming up. Personally, I don't have a problem with young MPs - it's something we need more of, and it could actually prove to be a great way to get young Canadians interested in politics. I came within one floor crossing of being a placeholder candidate for the Liberals in 2005, so I'm open to the idea that these political rookies might actually be a breath of fresh air in Ottawa. If they handle themselves well, the media, and voters, will fall in love with them. The larger concern for Layton is not so much the age of his MPs, it's their beliefs. It wouldn't at all surprise me if a dozen or two of the Layton Bunch are quasi-separatists, setting the stage for some very uncomfortable decisions in the years ahead. Layton's position on the Clarity Act, Bill 101, and the Constitution is a ticking time bomb waiting to explode. So there are challenges ahead for Layton and the NDP. If they look and sound like a government in waiting for the next four years, they might very well find themselves in power come 2015. If they don't? Well, these gains could disappear as quickly as they materialized. I'll be doing a social media session at the Alberta Liberal Party's "Politics Re imagined" convention on the weekend of May 28th, in Calgary. The Liberal Party will name an interim leader this Wednesday. While it may not be the most important decision to make over the next four years, it still deserves careful consideration. All indications are the permanent leader won't be chosen for at least another year - and maybe two - so the interim leader will be the face of the Liberal Party as it regroups and rebuilds, all the while trying to remain relevant. Sadly, we find ourselves with only 34 candidates for the job, so it's actually fairly simple to write a short list. For starters, no party's interim leader should ever be running to be permanent leader, except in extraordinary circumstances, such as war, disaster, or the national executive wanting Michael Ignatieff in charge. The reasons for this should be self evident, and Rob Silver spells them out here. I'd also add that any hint the "party elites" giving an unfair advantage to a chosen candidate would not exactly be in the spirit of engaging and unifying the membership. So that likely means LeBlanc and Trudeau will take a pass, while they consider their options. It's been argued the interim leader should be bilingual. Now, there are degrees of bilingualism, but I generally agree with this sentiment. Ralph Goodale would likely be the best candidate if not for ce petit problème. Similarly, picking Wayne Easter would have been a nice thank you to PEI, which now makes up 9% of the Liberal caucus, but he's a one language man himself. Stephane Dion: He's not being seriously considered, but I include his name here since someone will surely mention him in the comments section. Going to Dion would be somewhat fitting, but we all know the caucus, party, and country would never go for it. At the very least, we need to make the Tories produce some new attack ads. Scott Brison: Brison is young, charismatic, and knows how to deliver a sound byte. Of course, for those very reasons, he may still be mulling over a run for the top job. Marc Garneau: He may not be as seasoned politically as the other candidates, but he has name recognition. On the downside, if you think spending time outside the country is bad, just imagine what the Tories will have to say about Garneau spending time outside the planet. David McGuinty: Would be a strong candidate, but his last name certainly complicates things with an Ontario provincial election on deck. John McCallum: Somewhat more experienced for the job than the others, by virtue of having been named interim Liberal leader in 2008 by CTV. Frank McKenna: Yes, I know he doesn't have a seat. But still, wouldn't he be a great selection! The above would all make fine leaders, and lesser known MPs like Geoff Regan, Kirsty Duncan, or Joyce Murray also deserve consideration. And hey, there's always Jimmy K, though it would mean an end to his leadership aspirations. 1. 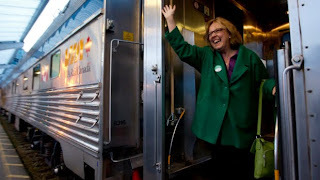 Will Elizabeth May win her seat? Yes. 2. Will the Conservatives sweep Alberta? No. Once again, Linda Duncan remains the orange thorn in their side. 3. Will Julian Fantino be re-elected? Yes. 4. Thomas Mulcair or Martin Cauchon in Outremont? Mulcair. Who would have thought the most highly anticipated race in Quebec before the election would turn into the least exciting race on election night? 5. Which polling company's publicly released final numbers will be closest to the actual results? Angus Reid. 6. Over/under on the highest level of support the Conservatives will hit in a national election poll - 42%. Puting aside the Compass siliness, Ipsos and Nanos both had the Tories at 43% once during the campaign. 7. Will the Liberals ever lead in a national election poll? Not even close. 8. Which party will run the most vicious attack ad? After some reflection and some feedback, I have to give this one to the Conservatives. All parties played fast and loose with the facts, but the Tories took direct shots at Ignatieff's patriotism. Perhaps it's fair and, truth be told, their election ads were tamer than their pre-writ ads. But in the absence of another obvious candidate, they take this one. 9. Which party will run the "best" ad? As voted on by you, the NDP. 10. Will the words "abortion", "women's right to choose", or some variant, be used in a TV commercial this campaign? Nope. 11. 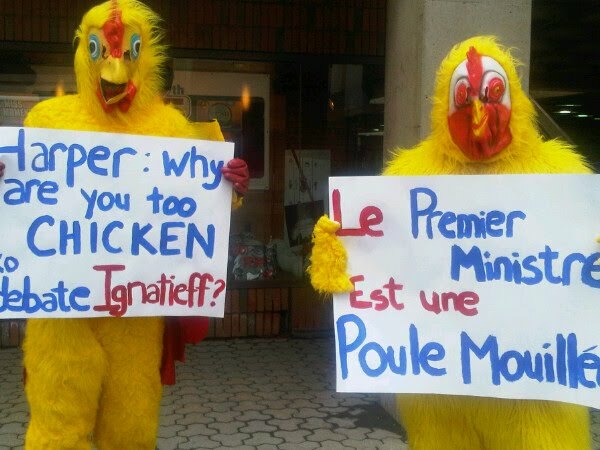 Will any Harper Cabinet Ministers appear in an english-language commercial this campaign? What's a Cabinet Minister? 12. 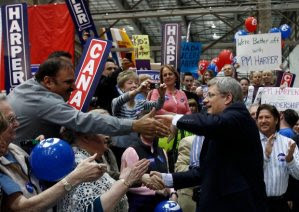 Will Harper's sweater vest make an appearance in a Conservative ad? The sweater vest has been replaced with the Canada jacket. 13. Conservative vote over/under in Crowfoot - 80% Believe it or not, but the overs have it. 14. Voter turn out over/under - 60% Just barely over. 17. The Bloc. Will they win more or less seats than last election? Ha! 18. Will over half the Liberal seats won come from Ontario? No. 19. Number of times Stephen Harper uses the word "coalition" in the (first) English language debate? Only once, but I gave a point to anyone who said 5 or less. 20. Who will the instant-polls show as having won the first English language debate? Harper. Though in retrospect, Layton was likely the real winner. The tie-break was the predicted seat count. The closest tie-break answer came from Alice Funke at Pundits Guide, who foresaw an NDP official opposition - but her entry was delivered time-stamped after the closing date. So the winner of the best seat prediction actually turns out to be the winner of the contest over all - RidingByRiding. He also had one of the better seat projection models this campaign, so give the man's blog a look. Everyone else had under 10 correct, so I won't embarass you by posting the full standings. But by all means, you can request your score either in the comments section or over e-mail. I also did an informal query on election day asking for your updated predictions. On that one, "Brian from Toronto", was the closest to the mark, predicting: CPC 155, NDP 105, Lib 24, BQ 18. Michael Ignatieff has been given a cozy office with a fireplace in University of Toronto’s acclaimed Massey College and will take up teaching duties in the law faculty, political-science department, Munk School of Global Affairs and the School of Public Policy and Governance. In the 2004 election, the Liberal Party lost 37 seats. Liberals blamed this on Adscam, and they blamed it on Dalton McGuinty. This was considered a bad result, but the good news was voters had gotten it out of their system and, regardless, they'd never make Stephen Harper Prime Minister so there was a little to worry about. Consider it a speed bump on the road to 200 seats. In the 2008 election, the Liberal Party lost 36 seats. This time, it was really all Stephane Dion's fault - him and that darn Green Shift! This was considered a bad result, but we'd all learned from the mistake in Montreal, so we'd just name Michael Ignatieff leader and take back government. The sooner the better - after all, leadership races can be messy and, as we'd seen, party members couldn't be trusted with an important decision like picking a leader. In the 2011 election, the Liberal Party lost 33 seats. The good news is that (I hope) everyone now recognizes there's a problem here. A problem that runs deeper than leadership. For this reason, I won't bother dissecting the Liberal campaign in too much detail. After all, it actually wasn't a bad campaign. The tour ran smoothly. There we no major gaffes or misspeaks. There were big crowds. The platform was fine. The ads were fine. Yeah, the debates were a bit of a disaster, and the leader couldn't connect with voters, but do people honestly think there is anything the Liberals could have done differently? Sure, a different leader might have held on to second place or might have kept Harper to a minority, but if the end goal is forming government, it's clear major changes are needed. The first thing Liberals need to do is put 2015 out of mind. That's a long ways away and given the tectonic shifts we saw in the political landscape over the past four weeks, it's foolish to predict with certainty what we'll be up against in four years. Maybe Harper will be hugely unpopular after a decade in power. Maybe Maxime Bernier will be the Tory leader. 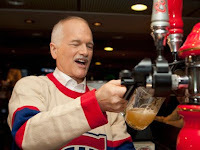 Maybe Jack Layton's Quebec caucus will be his undoing. Maybe a Mulcair-led NDP will be flying high in the polls (I'll believe that when I see it). Maybe the Bloc will be back. Maybe the Greens will be polling in the high 20s. There's no way for us to know what the future holds, so the Liberals need to look inwards and get their own act together before worrying about who they're running against. In my mind, everything should be on the table, and party members should be the ones to decide after careful and thoughtful debate. I personally think merging with the NDP is a foolish idea, but some Liberals think it makes sense and they deserve to be heard. Let's figure that out and then move on together. Personally, I'd like to see the Liberals take a strong stand against the soft-nationalist policies of the Bloc NDP, but a lot of Liberals will disagree, wanting to win back Quebec. Let's figure out where we stand and then move on together. Not just for show, but for real. Ever since I've been involved (and I'm sure before then), the party has let the membership talk and then ignored what they had to say. There's a 14-step policy process, where policies suggested by individual Liberals can climb all the way to the floor at a national convention where, if enough Liberals support them, they may one day be filed away in a binder in the PMO OLO LO. Now, I have a lot of ideas. Most are probably stupid. I'm not going to rehash them all now, because I'd basically be retyping the blog post I wrote after the last election. Or the election before that. Sadly, little has changed in 5 years. I have a lot to say about this and, judging from the e-mails, blog posts, and Facebook notes I've seen flying in the past 48 hours, a lot of Liberals do too. So here's what I'm willing to do. Send me your ideas of what you think the Liberal Party needs to do moving forward, and I'll post them here. Even if I think something's a dumb idea, I'll post it, because I'm not the arbiter of what's a good idea and what's a bad idea. There's definitely a lot of work to do. We need to recognize there's a chance the Liberal Party may very well fade away into oblivion. There's also a chance we could be in power within an election or two. As we've all learned over the past month, politics is unpredictable and making bold predictions with certainty is a good way to look awfully silly. The next four years may very well be the most important in the history of the Liberal Party, so let's get to work. Quick! Someone send out Ruth Ellen Brosseau to run damage control! Over the past month, I've asked you to rate election commercials. I've gone back and calculated the mean grade for each, and will now count down the top 5 ads of the election. You'll notice the following are all NDP or Liberal commercials. The Greens' clever "change the channel" spot comes in at number 6, but out of the 17 ads I asked you to rate, Tory commercials finished 10, 11, 13, 14, and 16. I think that's more a product of who was rating the ads than their quality. After all, Patrick Muttart's micro-targeting likely hasn't identified readers of Liberal blogs as a key Conservative voting block. For the record, I think the Just Visiting campaign and the subsequent series of Tax Attacks against Ignatieff were, hands down, the most effective commercials of the entire (pre) campaign. In terms of production values, this was the best ad of the campaign. It's got great visuals, great audio, and the heart monitor creates a real sense of urgency. It goes after Harper on an issue that is important to voters. The only knock on it would be that it doesn't give anyone a reason to vote Liberal. It likely didn't help that Ignatieff wasn't talking much about Liberal plans for Health Care on the ground while this one was on the air. 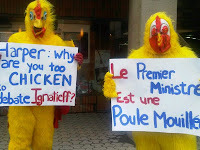 Like the previous Liberal ad, this one also attacks Harper on Health Care...but from a completely different direction. It uses cartoons, it uses a specific example, and it ends with Jack giving the NDP alternative. It's hard to say which strategy is better or worse, but the end result was a nearly identical grade for both. I suspect if I had people rate all the ads today, this one wouldn't crack the top 10. This commercial was released pre-writ when everyone (at least everyone in the blogosphere) was wound up on the contempt ruling and the scandal of the day the Tories were serving up. Those issues went nowhere quickly during the campaign. This was my personal favourite. It humanized Ignatieff and helped him connect with voters on an emotional issue many Canadians have gone through themselves. Moreover, it showed the Liberals had a plan to address a problem. It certainly wasn't as flashy as the other two Liberal ads above, but ads don't always have to be flashy to get you votes. This ad and the Imagine follow-up are exactly what you want to air to close the deal when your party is surging. It's feel good, it shows momentum, it gives the final voting pitch. Most notable is how Jack-centric this ad was. The commercial focuses exclusively on the NDP leader and shows him talking about how "I will hire doctors" - not how "we will hire doctors". All this was likely wise since, after all, people voted for Jack, not the NDP. So you can mark down "NDP" on your scorecards for the best ad question on my election pool. I still need to pick a "nastiest" ad of the campaign and, truth be told, I'm torn. The Health Care spots above were unfair to Harper, as was the NDP's jab at Ignatieff's voting record. Then you have basically every negative commercial run by the Conservatives this election, attacking Ignatieff and Layton on coalitions, phantom IPod taxes, and even Ignatieff's loyalty to Canada. In this flaming cesspool of negativity, it's hard to pick a "winner", so I'm open to suggestions in the comments section. If there's one thing these election results have shown, it's that we all owe Stephane Dion a big apology. For the past 3 years, he has been the punchline of every political joke. He has been ridiculed, and treated as if he were the biggest failure in the history of Canadian politics. Right about now, 77 seats sure ain't looking that bad. The hardest part of last night for me was watching so many quality MPs go down in defeat. All too often, the individual casualties of a blood bath like this are overlooked, and aren't given a proper farewell. So let me take a minute to thank a few of my favourites for making a difference. Gone is Gerard Kennedy, who I had the honour of supporting for leader five years ago. One of the reasons I backed Gerard was because he was one of the few people back then who recognized the need to renew and rebuild the Liberal Party. We all recognize that now, and I can only hope Gerard will be a part of that rebuilding, even if it's not as an MP. Gone is Ken Dryden, arguably the heart of the Liberal Party. Dryden is one of the most thoughtful politicians you'll ever meet and he believed in politics for a purpose, not just politics for the sake of politics. Dryden's vision of Canada will be missed at a time when the Liberal Party tries to come to grips with what it truly believes in. There are others who I've forgotten or just didn't know as well, but who are equally deserving of praise. I thank them all for their service to the Liberal Party and to their country. Then there are those who never got a chance to go to Ottawa. Strong candidates, like Christine Innes, who I spent much of this election trying to keep up with as she sprinted door to door to meet voters. And let's not forget all those who put their names forward to run, knowing it would take a miracle for them to win. Having volunteered on a lot of campaigns like that over the years, I fully appreciate the kind of commitment and idealism that takes. Finally, there is the one MP who lost a lot more than his seat last night. Long time readers will know I've always had doubts about Michael Ignatieff's ability to lead the Liberal Party, and I took issue with the way he commandeered the leadership of the party. Still, I've warmed to the man greatly over the past year, and I always did like the concept of Michael Ignatieff. If I was writing a Canadian political drama a la West Wing, I'd probably create a protagonist a lot like Michael. He is, after all, exactly what voters say they're looking for in a leader. He's intelligent. He has seen the world. He's not a career politician. It's hard not to fall in love with the concept of Michael Ignatieff. Yesterday, we found out just how easy it is to not fall in love with the reality of Michael Ignatieff. In the real world, politics is a job like any other, and we shouldn't be surprised when the guys who have been doing it their whole lives prove to be better at it than the guy who picked it up in his late 50s. 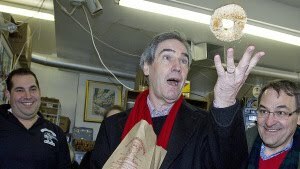 Michael Ignatieff simply was not able to connect with voters the same way Jack Layton could connect with voters. I'll write up a proper post-mortem on what went wrong for Michael Ignatieff the party leader in the coming days but for now, a moment of silence for Michael Ignatieff the MP, who didn't deserve to lose his seat. We need accomplished individuals like him in politics, regardless of the party they run for. The Tories won just 6 seats in Quebec last night. Going down in defeat were arguably Harper's three strongest Cabinet Ministers from the province: JP Blackburn, Josee Verner, and Lawrence Cannon. With Harper's leadership on the party now secure, it seems highly likely that Maxime Bernier could find himself in a high profile Cabinet post when Parliament resumes. I'll announce the winners from my election pool later this week. One of the questions there asked which polling company's final poll numbers would hit closest to the mark. So congrats to those of you who picked Angus. The top 6 companies on that list were within the margin of error on their numbers, so they too deserve a round of applause. So a similar performance by all the mathematical models, except for 308 who has already offered a brief post mortem. I will add that my prediction was further off the mark from my projection - I made the same faulty assumptions as the EPP did, assuming strong incumbents could hold their seats. The largest problem with my projection was the polls it fed off - specifically the low Conservative numbers (which I did foresee as a potential problem). 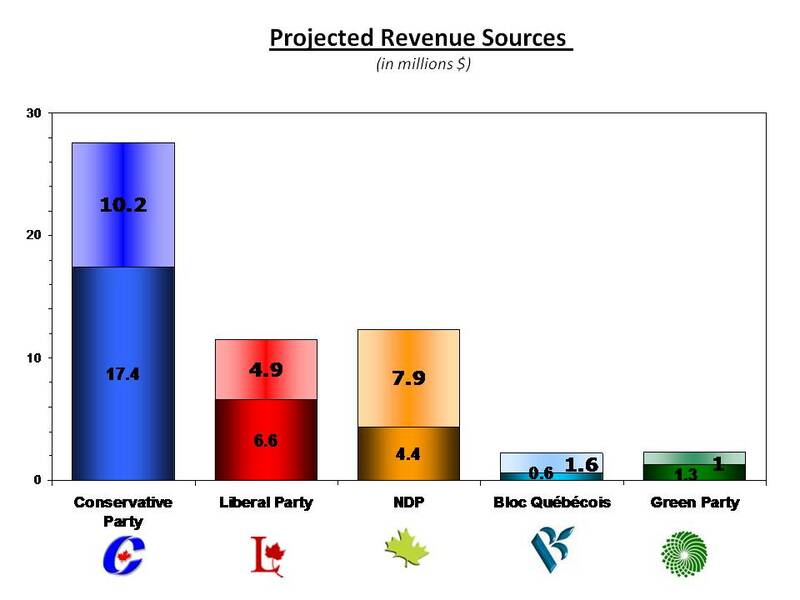 If I plug the actual numbers in, my model projects: CPC 168.8, NDP 94.6, Lib 34.0, Bloc 10.1. The regional splits break down nicely too, except for Quebec where I'm a bit high on the Bloc and low on the NDP. But this model was supposed to handle pollsters missing the mark. A few of the results fell outside the 95% confidence interval so this is, as Jack Layton would say, a hash tag fail. I'll put this one to bed for a bit and start tinkering again over the summer, but I think this speaks to the limitations of any seat projection model. They're useful tools, but it's incredibly naive to assume they can predict the total seat count, much less individual riding results. But that's ok. If they worked, it would make election nights a bore. Canada is on the verge of being plunged into a $300-million federal election and after it’s all over Parliament could well look the same, an EKOS seat projection concludes. “No party would shift by more than a handful of seats and qualitatively this would be a virtually identical balance of power to what we have now,” the polling firm says on its website. The report is based on data collected Feb. 24 to March 8. I re-post this only as one final reminder that campaigns matter.